, a Spanish Jesuit and cardinal, was born Nov. 28, 1583, at Madrid. His talents began to appear so early, that it is said he was able, at three years of age, to read not only printed books, but manuscripts. He maintained theses at fourteen, and was sent to study the taw, soon after, at Salamanca; where he entered into the order f the Jesuits in 1603, against his father’s wish. After finishing his course of philosophy among the Jesuits of Pampeluna, and of divinity at Salamanca, he was sent to Seville by his superiors, on his father’s death, to take possession of his patrimony, which was very considerable, and Which he divided among the Jesuits of Salamanca. 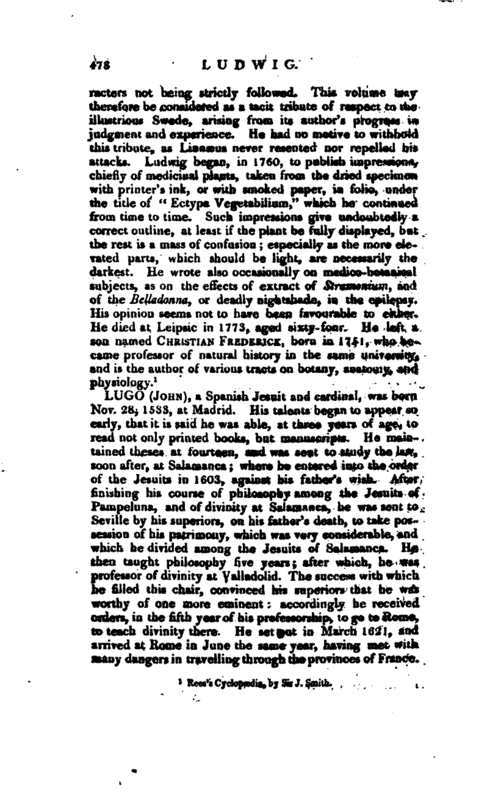 He then taught philosophy five years after which, he was professor of divinity at Valladolid. 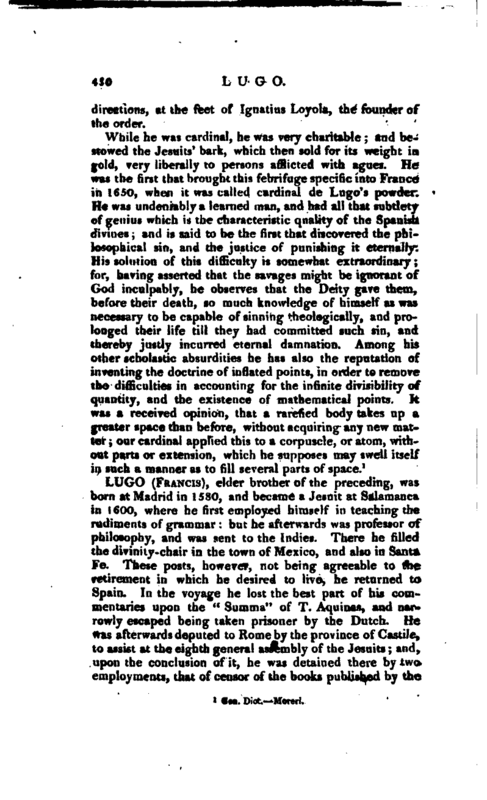 The success with which he filled this chair, convinced his superiors that he was worthy of one more eminent: accordingly he received orders, in the fifth year of his professorship, to go to Rome, to teach divinity there. He set out in March 1621, and arrived at Rome in June the same year, having met with Bjanv dangers in travelling through the provinces of France. | He taught divinity at Rome for twenty years, and attended wholly to that employ, without making his court to the cardinals, or visiting any ambassadors. the fourth of which he dedicated to Urban VIII. Upon this occasion he went for the first time to pay his respects to the pope, by whom he was very graciously received; and from that time so highly respected, that Urban made him a cardinal, in Dec. 1643, without any previous notice or solicitation. To this promotion, however, he is said to have shown the greatest repugnance, and would not permit the Jesuits’ college to discover any signs of joy, or grant the scholars a holiday. He looked upon the coach, which cardinal Barberifli sent him, as his coffin; and when he was in the pope’s palace, he told the officers who were going to put on his cardinal’s robes, that he was resolved to represent first to his holiness, that the vows he had made as a Jesuit would not permit him to accept of a cardinal’s hat. He was answered, that the pope had dispensed with those vows. 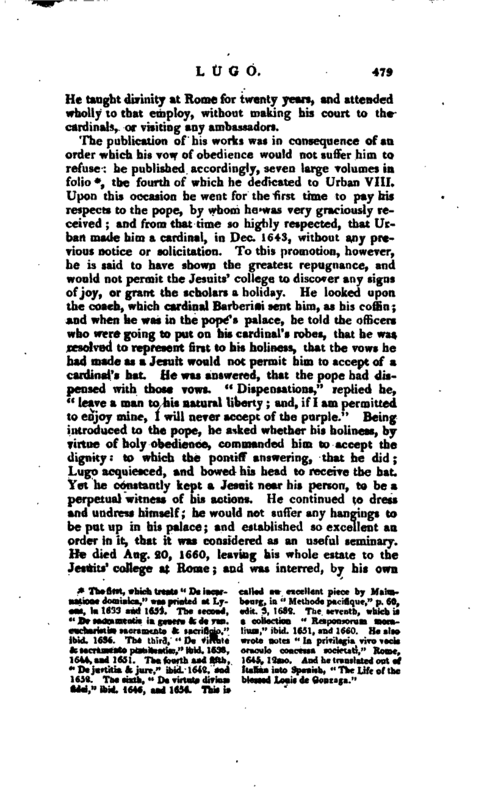 “Dispensations,” replied he, “leave a man to his natural liberty and, if I am permitted to enjoy mine, I will never accept of the purple.” Being introduced to the pope, he asked whether his holiness, by virtue of holy obedience, commanded him to accept the dignity ' to which the pontiff answering, that he did; Lugo acquiesced, and bowed his head to receive the hat. Yet he constantly kept a Jesuit near his person, to be a perpetual witness of his actions. He continued to dress and undress himself; he would not suffer any hangings to be put up in his palace; and established so excellent an order in it, that it was considered as an useful seminary. He died Aug. 20, 1660, leaving his whole estate to the Jesuits’ college at Rome; and was interred, by his own | directions, at the feet of Ignatius Loyola, the founder of the order.